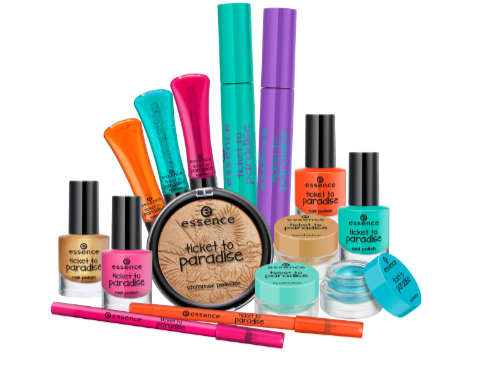 When I received an e-mail from the essence press and saw the photos of the upcoming limited edition collection Ticket To Paradise I instantly fell in love with all of the products! I went to the store multiple times to see if they were selling this collection already but I walked away dissapointed multiple times because it hadn't arrived yet! But when I came back today they finally had it. Yay! Iwas looking at all of their products and this shimmer powder in #01 Tropical Heat got my attention right away. I really love the floral pattern on this powder, it reminds me a lot of a tropical island. And since the weather today is so nice here it made me want to buy it even more! This photo was taken when a bit of sunlight was shining on the powder. This is when you can see the gold shimmers at their best. Gorgeous! It's not an over-spray, the whole powder is gold and shimmery even after swatching it a few times. This is a swatch taken outside in direct sunlight. Once applied to the face the color is not as vibrant as it seems on the photo above, it's more of a golden sheen. Which is the look essence was going for. For €2,99 you can't really go wrong with this pretty powder. I think it's worth the price because it gives you a fresh shimmering glow and the packaging is surprisingly sturdy for a budget brand. So thumbs up for that! Love it! I just bought one!